The Oregon Ducks football team is scheduled to play its annual Spring Game on what should be a picturesque Saturday inside Autzen Stadium. And with it, the 2014 season will be officially under way. And, like every season, another batch of seniors have graduated, which leads to a bunch of question marks heading into the Spring Game coming up on Saturday. Some of the biggest (literally and figuratively) holes on the roster appear to be along the defensive line. With guys such as Wade Killiikipi, Taylor Hart, and Ricky Heimuli now out, who will be in? The front line seems all but set with the group of Deforest Buckner, Tony Washington, Alex Balducci, and Arik Armstead. But beyond those four, things appear to be muddled at best. The Ducks are arguably still without a prototypical gap-eating defensive tackle, but they definitely have a bunch of huge and talented football players, and most already have a few years of experience in the system. Here are six “Other” defensive lineman to watch for during the Spring Game. Ok, so probably the first thing that stands out with Stetzon is his 6-foot-9, frame which is unusually tall for a football player. Like his brother Brandon, who played at 6-foot-8, you would think basketball or volleyball would be a more likely sport to play at that height. But if you watched Brandon play, you might remember how his long arms helped him engage and gain leverage against would-be blockers, and bat down passes and kicks at the line. After a religious mission, a season at a junior college and then a redshirt year in 2012, Stetzon found the field last season in four games and seems poised to take another step forward this season. Players such as Sam Kamp and T.J. Daniel have bulked up in the offseason. Kamp made news last week when a video of the player seemed to show drastic weight gain since the Alamo Bowl, and Kamp mentioned adding over 35 pounds in the offseason. 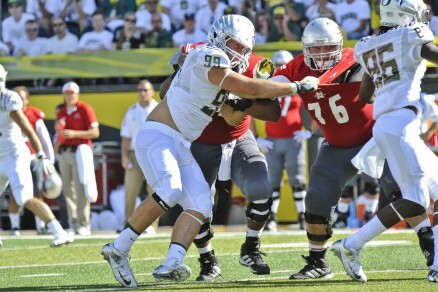 Adding that kind of weight would seem to indicate the Ducks intend to use Kamp inside, perhaps as a primary back-up to 305-pound nose tackle Alex Balducci. Gaining THIRTY-FIVE pounds, though, seems like a lot for anyone, and it will be interesting to see where the coaches line him up, and how effective he is against the experienced and increasingly physical bunch along the Oregon offensive line. One of the more intriguing prospects on the roster, Talia is a rare (for Oregon to recruit) upperclassman JC-transfer that the Ducks and roughly half of the other top-level teams in the country were salivating over, given his rare blend of size and athleticism. Tui’s name has been frequently appearing — and for good reasons — in the spring practice reports, and there appears to be a great opportunity for him to play his way into the rotation this fall. For a stadium full of fans, Saturday will be the first up close look at the player who was ranked as the No. 1 defensive end prospect by ESPN. You don’t get much further under the radar than Cody Carriger. But when playing small school football in his home town of Butte, Montana, the former tight end and outside linebacker made his presence felt. His bio reads like many of the Ducks players, voted to various all-star and high school all-American teams, but one thing in particular stands out: He ran an 11.4-second 100-meter dash as a senior in high school. While that time is not considered fast among Olympic sprinters, and may not be enough to run stride for stride with many division one wide receivers, it is scary fast at 6-6, 245. Like Bair, Carriger got his first taste of the field during six games last season, and his size and speed could make it hard to keep him on the sidelines in 2014. Another player with scary speed for his size is Christian French. 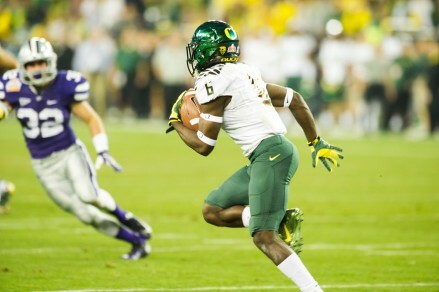 Players such as Cody Carriger and Christian French have the size and speed, and neither player is much slower on a track than even De’Anthony Thomas. Originally a tight end prospect, French moved to defense and has been lighting up position drills ever since. In high school, French posted a ridiculous 10.68 (De’Anthony Thomas ran a 10.57) 100 meter dash time. In 2012, French posted a 4.98, 40 time and a 32.5″ vertical jump, both tops for the position on the Duck squad. Over the past two seasons, French has already appeared in 20 games during his U of O career – so suddenly, French is among the most experienced along the D-line. If the best is yet to be for the player rated by Rivals, Scout, and ESPN as the No. 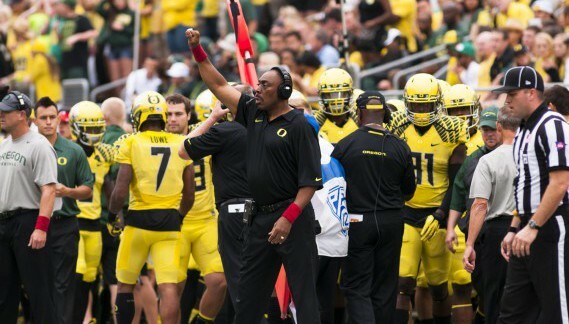 5 overall athlete and consensus top 100 player nationally, Duck fans might have a new reason to break out that old No. 96 (Dion Jordan’s) jersey again this fall. T.J. Daniel redshirted last season after playing in 9 games as a true freshman. Now up, way up, to 275, the one time tight end has the size and athleticism to be effective at any position along the line. Daniel has been mentioned as a standout player in practice since 2012, and tomorrow, he can show the fans why. A versatile player like T.J. could be exactly what the Ducks need to fill the shoes left by Taylor Hart – a player who is big enough, strong enough, and smart enough to handle any role along the defensive line. So, who will step up for Don Pellum’s defense in the fall? The performances from this group on Saturday will be the fans’ first chance to look for any separation.